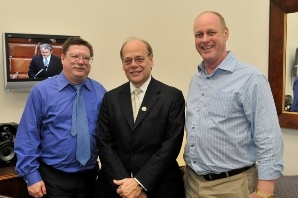 Memphis Local 2763 Secretary-Treasurer John Kalkstein (left) and Vice President Kenneth Vicknair (right) met with Tennessee Democratic Representative Steve Cohen (center) to discuss issues facing workers at Northwest-Delta Air Lines. Transportation GVP Robert Roach, Jr. testified this week before the House Subcommittee on Commercial and Administrative Law and called for changes to existing bankruptcy laws that have been used to extract massive concessions from workers while restricting their right to employ the self help provisions in their agreements. The IAM’s complete testimony is available at www.goiam.org/transportation. The Machinists union believes there is an immediate need for bankruptcy reform that should apply to all private sector workers covered by collective bargaining agreements.